MI6 revealed earlier this week that the title of the fourth novel in the Young James Bond series by author Charlie Higson was Hurricane Gold. Today, Puffin and Ian Fleming Publications confirmed that title officially and that the book will be published on 6th September 2007. For the first time in the history of the series, Hurricane Gold will be published initially in hardback, priced £12.99. The eagerly awaited next installment will be a special treat for Young Bond fans. In keeping with the theme of the title, it will have a gold cover with luxury debossed lettering and gilt-edged pages. Above: Author Charlie Higson holding a copy of the forthcoming adventure "Hurricane Gold"
Hurricane Gold, the fourth adventure in a planned series of five, is set in Mexico and on an island off the Mexican coast. A safe haven for criminals, the only way off the island is through the deadly Avenida de la Muerte. It is on this island that James finds himself trapped, among some of the world's most evil criminals. The Young Bond books have to date sold over half a million copies combined. The series was launched with SilverFin in March 2005 and was followed by Blood Fever in January 2006 and Double Or Die, published in January this year. Hurricane Gold will be published in the UK as a hardback by Puffin Books, which marks another departure as the previous three installments which were first released in the UK as paperbacks. 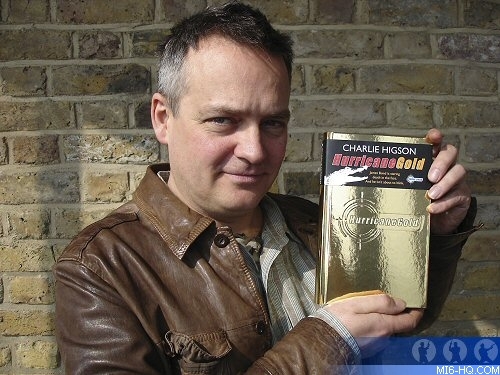 Charlie Higson confirmed to MI6 earlier this year that he had completed work on the fourth novel Hurricane Gold by the end of 2006. When asked whether he would continue the pattern of following Fleming's templates by echoing some elements of the fourth 007 novel "Diamonds Are Forever", Higson said "there are some similarities, it is set in the Americas, there are gangsters in it but there is no cowboy train!" Higson continued, "after book three being set in London I wanted very much to send Bond somewhere exotic and hot. 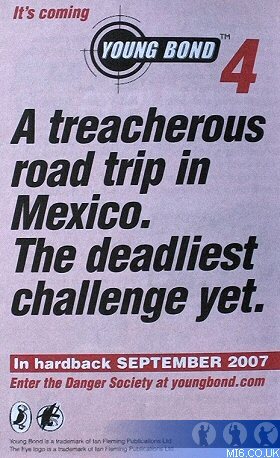 It is largely set in Mexico and the Caribbean and the plot does involve gangsters." Now that the Book 4 timetable has been stepped up, readers may expect the fifth and final entry in the series to be released later in 2008 to coincide with the Ian Fleming centenary.